TORONTO -- The head of Google's parent company contrasted divisive U.S. politics against Canada's innovation and immigration-friendly policies Thursday, adding his company owes this country a favour -- one the Prime Minister said he'd be sure to call in. 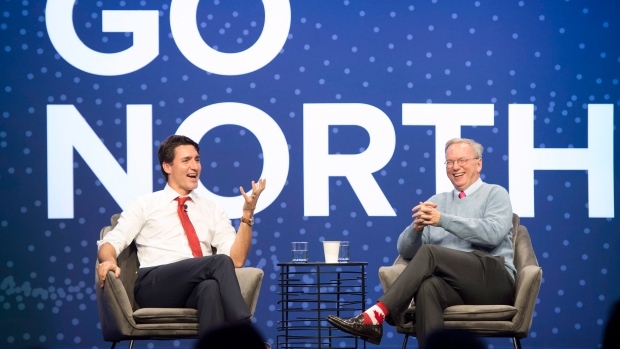 Alphabet Inc. chairman Eric Schmidt said during an onstage chat with Justin Trudeau in Toronto that his company is "enormously thankful to Canadians" for the country's artificial intelligence innovations. 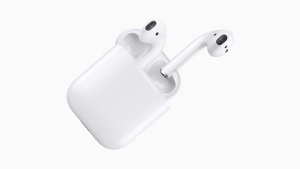 "We now use it throughout our entire business and it's a major driver of our corporate success," he said at Google's Go North conference. "So we owe you, right. And we remember." Trudeau replied that Canada would make sure to hold him to it, now that it was "on record." "We'll make sure that works out," the prime minister quipped. Google is among the backers of the Vector Institute, a Toronto-based artificial intelligence research lab which is part of Ottawa's strategy to drive innovation in Canada. Ottawa is putting up to $50 million into the institute, Ontario is investing $50 million and more than 30 private-sector companies are set to invest $80 million. That's in addition to Google's AI lab in Montreal, which the tech giant launched in November 2016. But as Google's relationship with Canada becomes increasingly cozy, relations between the U.S. and its northern neighbour have come under pressure. The U.S., Canada and Mexico have been in prolonged negotiations over the North American Free Trade Agreement, a deal Schmidt said has been "enormously successful." Schmidt added that he was worried about the impact that U.S. identity politics under Donald Trump -- in contrast to Canada's focus on inclusivity and diversity -- would have on the countries' dealings. Schmidt noted that the U.S. is "critically dependent" on supply chains from Canada, "including the back and forth that we have in the tech industry." "I'm concerned that the politics in the United States are going to drive various wedges between the excellent historical relations between Canada and the United States," said Schmidt, who wore socks were emblazoned with the Canadian flag. The former Google CEO added that the North American Free Trade Agreement has been very successful and asked the Prime Minister about a timeline for when the negotiations will be complete. Trudeau said Canada is "carefully evaluating everything they put forward" and warned of dire consequences if the deal collapses. "As soon as you thicken that border, or shut things down, there are going to be negative impacts on the American economy, on American workers," he said. "Of course there can be way more impacts on Canada because we are much smaller and more dependent on the U.S. But, at the same time, it's gonna hurt if we fail to move forward with NAFTA." He also noted Canada recently signed a trade deal with Europe and said the country is engaging with Asia as it looks to "diversify a certain bit." Meanwhile, Trudeau said there is a "unity of approach and purpose on this" across the political spectrum in Canada, which is an "advantage." "We are not going to be pushed into accepting something that is bad for Canada." For more from the conference, follow CTVNews.ca's Josh Elliott on the CTVNews Instagram account, or on his Twitter account.